Blackberries are another fruit whose color is very dark, almost like a deep purple. There are more purple foods than blue, but both colors are scarcer than red foods. These are more predominant in nature, starting with apples and cranberries and continuing with red peppers and tomatoes. But my favorite red fruit this time of year is raspberries. Actually, the color of raspberries is also unique, not really pink and not really red. Maybe the unique colors of these berries are what makes them so interesting to try. Maybe my love of blueberries comes from my childhood memory of picking wild blueberries (also called huckleberries) with my Great Aunt Molly, who made delicious huckleberry jam. While I disliked walking up and down the hot mountain path looking for the berries, I loved the jam! And when I worked as a bed & breakfast cook in Maine a few years ago, I used to pick fresh blackberries from a bush in the yard next to the house. For everyone five berries I picked, I must have eaten one. My breakfast really was al fresco! As for red raspberries, I simply love them for no other reason than they seem to melt in my mouth. According to the World’s Healthiest Foods Site, blueberries are packed with antioxidant phytonutrients, which are nutrients from the plant kingdom. Antioxidants neutralize damage to cells, and in the case of blueberries, they support the cells that, if damaged, can lead to cataracts, glaucoma, varicose veins, hemorrhoids, peptic ulcers, heart disease and cancer. Anthocyanins, the blue-red pigment in blueberries, improve the integrity of support structures in the vascular system, enhance the effects of Vitamin C, and improve capillary integrity by preventing free-radical damage. Concerning blackberries, the berries and juice build the blood, which means they could be used to treat anemia. But in Healing with the Herbs of Life, the authors caution not to overdo blackberries, as they can cause loose bowels. Blueberries, red raspberries, and blackberries are good sources of vitamin A and potassium. Also, blackberries and raspberries are on the list of high fiber foods. However, since berries cannot be peeled or scrubbed, I urge you to purchase them organically grown. Have I convinced you of the importance of including organic berries in your diet? I hope so, because they are good for you and they taste delicious when ripe. In fact, they fall under my heading of The Good Taste of Health Recipes. 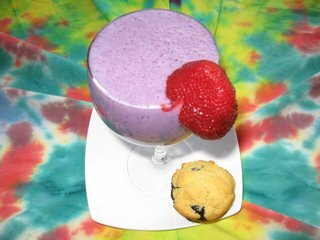 Below are some very berry nice GToH recipes to whet your summer appetite. Place all the ingredients in a blender and buzz until smooth. Enjoy immediately. Feel free to use any of your favorite berries in season. If fresh berries are not available organically grown, consider frozen ones without sugar, such as the berry mix from Cascadia Farms. 2. 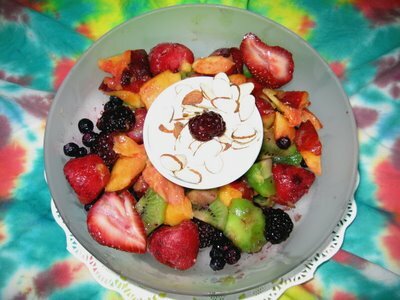 Place in an attractive bowl and add a very little of your favorite juice, such as cranberry or pomegranate. 4. Top with slivered almonds or unsweetened coconut. one cup organic blueberries+, washed with any stems removed. 1. Mix dry ingredients together in one large bowl. 2. Mix wet ingredients in a smaller bowl. 3. Add wet items to dry ingredients and combine well. 4. 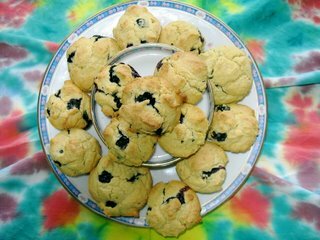 Pour into mini-muffin tins or regular size muffin tins that have been oiled. 5. Bake in a preheated 350-degree oven for 25-35 minutes, depending on the size of your muffin openings in the tin. Use a toothpick or kabob stick to check for doneness. Yield: About 20 mini-muffins or 9-10 regular-sized muffins. Serve with organic wild berry jam. I purchased an organic fruit spread from Bionaturae, which contains organic wild berries and no extra sugar. REMEMBER, these are muffins, not cupcakes, so they wonâ€™t be sweet. Next posting maybe delayed because of July 4th weekend activities. If so, I will “blog” you in two weeks. Will the Real Bagel Please Roll Over? Smells evoke strong memories. The aroma of bagels wafting from Kramer’s Bagel Factory is still strong in my nostrils whenever I devour a warm bagel. Growing up in the 40s and 50s, Jewish bakeries were the only bagel game in town. Fresh and frozen bagels in supermarkets or coffee shops were still “round years” away. One of my fondest childhood memories is going down to Kramer’s Bakery after Shabbos, when Kramer baked its only product: BAGELS. They were either plain water bagels or egg bagels. They created these wonderfully round, crusty delights only once each week, for Sunday morning Jewish breakfasts, served â€œshmearedâ€ with cream cheese, and topped with lox and a slice of onion. My mind can recall that taste even when I am not eating a bagel. Actually, Kramerâ€™s was just a factory with a retail counter—no storefront, no cookies, or cakes—nada! Just bagels! No blueberries, no jalapeno peppers, or other designer bagels found today. Eating my warm bagel from Kramer’s, that yeasty taste, the crunchy outside and the soft inside was a real treat. That first bite, when heat literally escaped from the bagel as my teeth made its first mark on this crusty circle of bread, was sheer delight. I would eat that one plain, straight from the warm paper bag that held two dozen bagels my father would buy for Sunday breakfast. The question for me is: Is a bagel still a bagel if it is stuffed with blueberries and has an eerie blue color? Is it still a bagel when spinach and feta cheese have been kneaded into the delicate dough center? How can I smear cream cheese on a salsa bagel? Should I maybe spread it with guacamole instead? Oy! Gevalt! A shonda on you, my grandmother would shriek! Finally, when I did my own informal survey of bagel places, I was told that plain bagels were still their best sellers. Then I looked up bagel in the dictionary and this was the definition: A bagel is defined as a “doughnut-shaped, yeast-leavened roll that is characterized by a crisp, shiny crust and a dense interior. Long regarded as a Jewish food item, the bagel is commonly eaten as a breakfast food or snack, often with toppings such as cream cheese and lox (sliced, smoked salmon. )” Did you see any mention of blueberries or hot peppers or raisins? NO! I rest my case! 1. Unwrap cheesecloth and place about 3 thicknesses into a bowl. 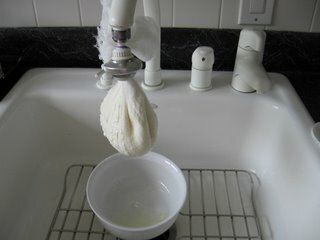 Spoon yogurt into cheesecloth. Tie and secure with a rubber band, wrapping the rubber band around the end of the faucet. Place bowl beneath the yogurt to catch the whey and allow to it drip overnight. 3. 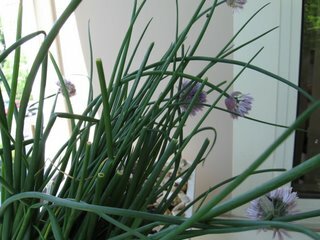 Take 2 or 3 stalks of chives and snip with scissors into tiny pieces. 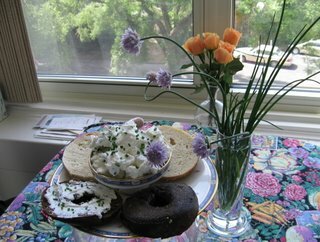 With a spatula or the back of a spoon, incorporate the chives into the yogurt cream cheese. (The yogurt will be spreadable, more like whipped cream cheese.) Use as much chives as you like, and feel free to add other herbs such as dill or veggies such as minced peppers. 4. Serve chilled with bagels or bread or in celery stalks. Yield: About one cup. You are currently browsing the Menupause weblog archives for June, 2006.